Wasserburg, Germany: – Pharmaceutical lactose specialist MEGGLE Excipients & Technology (MEGGLE) is returning as an exhibitor to the Drug Delivery to the Lungs (DDL) Conference in Edinburgh, showcasing its expanded range of lactose anhydrous and lactose monohydrate-based excipients. MEGGLE, whose association with the DDL Conference extends back more than a decade, is a Silver Sponsor of the event. For the sixth year in succession, MEGGLE will be a DDL exhibitor with a stand at Booth 230 at the Edinburgh International Conference Center (EICC), from where it will display its extensive product portfolio for dry powder inhalation, featuring the InhaLac® range of sieved, milled and micronized inhalative lactose monohydrates. The range is now extended by the addition of InhaLac® 160 as a sieved excipient ideal of nasal and pulmonary applications. 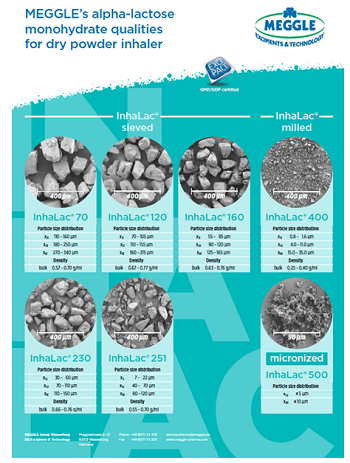 Developed at MEGGLE’s Wasserburg laboratories in Germany, InhaLac 160 is characterized by median particle size of approximately 110 μm, The new product fills a gap in the InhaLac range of coarse sieved lactose grades for dry powder inhalation, sitting between the coarser lactose InhaLac® 120 and the finer lactose InhaLac® 230. This GMP/GDP certified sieved lactose is therefore suitable for pulmonary and nasal drug delivery and offers a range of benefits that include a dedicated production process, highly controlled powder characteristics, highest microbial quality including low endotoxins and retesting after 24 months. MEGGLE will submit a poster created with research partners RCPE on ‘Impact of relative humidity and powder filling level on the electrostatic charging behaviour of different capsule types’. Two recent MEGGLE arrivals, Project Manager R&D Karin Hellauer and Project Manager DPI Dr. Lukas Neudert, will attend the DDL for the first time. “We are looking forward to meeting the DDL community and to exchanging insights about pulmonary and nasal drug delivery,” said Ms. Hellauer. “Once again, MEGGLE will provide significant input to the conference agenda, with our poster on electrostatic charging and with expert insights on optimum use of lactose excipients in dry powder granulation processes,” commented Dr. Neudert. Bavarian-based MEGGLE Wasserburg is one of the world’s experts in lactose-based excipients and powder technology. From its roots as a dairy operation in the late 1880s, MEGGLE has become one of the world’s leading manufacturers of pharmaceutical lactose, supplying the pharma market segment with a broad-based and unique lactose product portfolio. MEGGLE Excipients & Technology has harnessed outstanding product quality and intelligent innovation to become a global leader in the manufacture of lactose-based excipients, focusing on products for direct tableting and dry powder inhalation. A multidisciplinary team of committed and highly qualified people allows MEGGLE clients to benefit from pioneering experience and innovative drive in industrial milk and whey processing. The company constantly strives to develop high-tech, functional products for solid dosage form applications, where they can deliver maximum performance. The company has introduced several pioneering products, notably Tablettose®, the world’s first agglomerated lactose for direct tableting, Cellactose® 80, a pioneering co-processed excipient based on cellulose-lactose for outstanding compression and flow properties and RetaLac®, the first direct compression co-processed excipient using a hypromellose-lactose base for modified sustained release and controlled release formulations. The Drug Delivery to the Lungs (DDL) Conference (DDL) provides an annual forum for scientists, academics, clinicians, regulatory and industry specialists involved in developing medicines for inhalation. DDL2018 is a three-day event opening December 12 at the Edinburgh International Conference Center (EICC) at The Exchange in the Scottish capital. The 2018 conference will feature five themed sessions each with a combination of invited and submitted lectures given by experts in the field of inhalation and students working to advance respiratory science. The event is organized by The Aerosol Society, with more information at: https://aerosol-soc.com/events/ddl2018/. Click on MEGGLE at DDL 2018 for more information. Click on MEGGLE to contact the company directly.